Hi ya'll, This is my second article here and I hope you enjoy reading it! First of all: Sorry about my poor english, and the bad photocuality, I hope you can still read it fine! Now, no good entry is a good entry without a cool scenic base, so heres how I make mine! First of all, I take a cap of some kind of pot or something. These are perfect for cool display bases, and most of the time the right size. 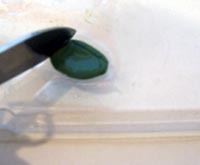 Now, take a greenstuff blob, and press it onto the pot. Then, spread it using a (wet!!) sculting tool. The water will help spreadding a lot! After this, use the flat plastic (again wet!!) to press the greenstuff very flat. 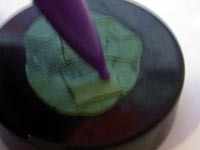 When neccesary, use sculting tool to remove hills of greenstuff after the pressing, and again press it with the flat plastic. 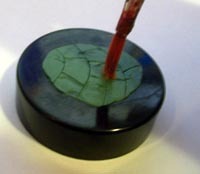 Then, use your hobby knife to mark the lines between the diffrent stones. When neccesary, use the knife to make the gap between te stones even bigger. 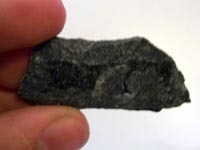 Also, if you like, you can make some cracks in the stones using your knife. Note: Keep it small! We will make the area even more realistic later! Now, use an old brush to press the greenstuff in realistic flatness, and stipple the stuff with it to create a fine texture. Now, we are going to add the marble texture to the base. 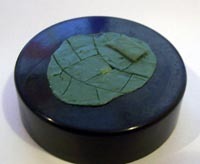 Use a piece of slate, make it wet with water (or it will stick o your greenstuff, and ruin your entire base!). Here we have it! A nice marble effect with a nice display base! But, for me, this wasn't interesting enough, so look further on page 2 for more details! Now, let us make some more detail, shall we milady? 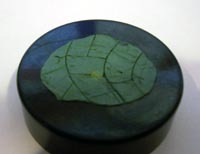 Cut it to the shape of a square with a hobby knife. 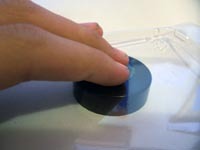 Now, remove the square with your hobby knife from the plastic, and add it to your base. After this, we will add some nails to the metal plate attached to the marble by the techmarines!! I still found the base a little broing, with all that surfaces... So I added gunnshells! 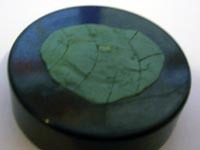 Just roll up a soucage of greenstuff, and cut small pieces from it. Carefully press them into your base, after a period of 4 hours. The small drying time of the gunnshells is used, becouse then the base isn't dry yet, and the gunnshells are as hard as rock! This way, its easy to press them into your base without ruining your carefully made gunnshells.